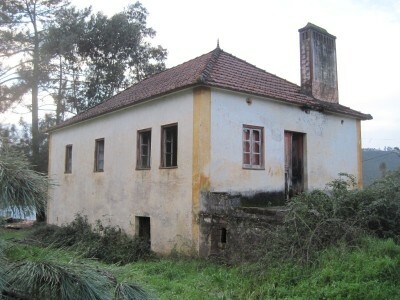 A two storey, old stone cottage in need of total renovation for sale near Cernache do Bonjardim, central Portugal. The cottage, which is set over two floors, has a footprint of 105 square meters of construction and is set on a plot measuring 1.245 square meters. The house is connected to neither mains water nor electricity, although both are just a few feet away from the house on the tarmac road.The house is built in stone. The first floor is accessed via stone steps from the front terrace. The entrance door opens into the large living room, to the right there is the rustic kitchen with the large traditional chimney. There are two bedrooms to the right and another two to the left of a corridor from this living room. Each bedroom has a window with views to the surrounding country side. The ceiling and the floors are wood and need to be replaced, the windows have wood frames and need to be replaced. The roof structure is wood and is still in reasonable order. The ground level is divided into two larger rooms and was used for storage purposes and could be converted into more living space.The land around the house is reasonably flat and has some pine trees growing on it although some have suffered by a recent storm and will make good firewood. The garden is mostly to the back of the house. The property is located on the tarmac road which only takes local traffic to a few further houses down the lane and it is only 1.5 km from the shores of the Castelo do Bode lake, where there is direct access to the water. Perfect for fishing and canoing and also popular for water skiing. Just two km down the river there is a little marine with restaurant and café. The location is very calm with only two near neighbors.The closest town to the property is situated at Cernache do Bonjardim, which is around 15 kilometres drive. Cernache do Bonjardim has cafes, bars, shops, mini-market, pharmacy and schools. The larger town of Serta is slightly further away being around 25 kilometres drive. Serta has several supermarkets, shops, restaurants, banks, schools, health centres, cafe bars, parks and municipal buildings and is easy to access off the IC8 dual carriageway.